Ben Thomas here, Video Editor and Assistant at Tyler Stableford Productions. In the next few posts, I am going to be talking to you about the ISO noise tests we did with our new Canon 1D-C Camera. Ah yes, the Canon 1D-C. Considered to be the the first Cinema DSLR camera. With the ability to shoot 1D-X caliber stills and shoot video using Canon’s Canon Log picture style, this camera seemed like a perfect mix of the light and fast setup we love from the 5D Mark III and the cinema look and flexibility of the C300. And with 4K resolution and 60 fps at Full HD on top of all that? We were ready to be sold and hoped it wasn’t too good to be true. While we waited for our pre-order to be filled, we did plenty of research online, watching both Shane Hurlbut’s extensive tests using color and grey cards (check those out on his Vimeo page here) and looking through Phillip Bloom’s tests (seen here) and we felt like we were getting a solid handle on what to expect from the 1D-C.
Once we finally received the camera, we wanted to do a couple of tests for ourselves. In particular, we wanted to test out the camera’s high ISO noise sensitivity in a scene that we would typically find ourselves shooting. The High ISO noise tests on Shane’s blog were helpful but we wanted to see how the camera worked in a real world environment. 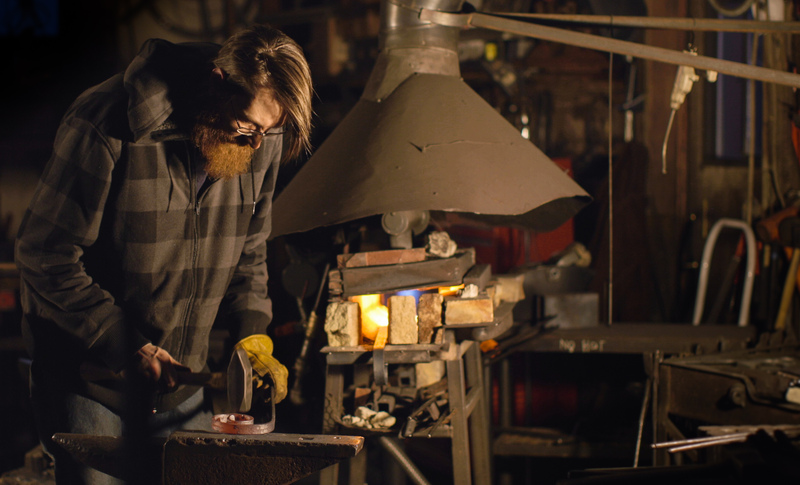 We had shot over at The Roaring Forge before, a blacksmith’s collective here in our hometown of Carbondale and we decided that it would make for our perfect real world test site. We set up with Tom working near the forge and had him do what he does best while we tested the 1D-C. Starting at ISO 400, the camera’s native ISO setting, we lit Tom so we could work at T/1.6, with a shutter speed of 1/50th of a second. We fixed our white balance at 4700K and understood that we would have some variations in color temperature as the changing ambient dusk light came through the windows. We went up a stop at a time from ISO 400 to ISO 800 to ISO 1600 all the way up to the camera’s HI-2 setting (ISO 204,800). We kept the exposure equal using Tiffen’s 4X5 Pro HV Neutral Density filter set and matching our histograms as we shifted the ISO. We were thrilled to see that even with just two clip-on reflector lights and some hardware store tungsten bulbs, we were able to light Tom easily. Additionally, working with ISOs up to 3200 was no problem with noise. We would have no issue showing dailies to clients of footage shot at ISOs as high as 3200 or even 6400 without adding any additional noise reduction. Beyond ISO 6400 gets a bit too noisy, but in a pinch, and with some noise reduction, even an ISO as high as 51,200 could be acceptable. While we liked the flexibility that Canon Log gave us in color grading, we were curious how it compared to our old Neutral Picture Style (-7 Sharpness, 0 Contrast, 0 Saturation, 0 Color Tone). We repeated the test to compare the two. Overall, we were impressed with the low light performance of the Canon 1D-C. Considering less than 2 years ago we were nervous going higher than ISO 1600 on the 5D Mark II or the 7D, the option of boosting up to ISO 3200 without hesitation is a huge improvement. Combining this with the improved resolution options and Canon Log settings, this camera will definitely take us up to the Cinema level in low light situations without much ISO noise while still allowing our kits to stay light and fast. Next, check out Canon 1D-C slow-motion tests.